1.25" Metal Disc, your choice of Aluminum or Sterling Silver. Approx 35 Characters (including spaces) can fit around the diameter of the Circle. 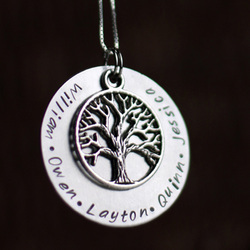 Adorned with an encircled Tree Charm and finished with an 18" Sterling Silver Box Chain with Coin Clasp.